Why does upgrading older air conditioning units make sense? Your satisfaction is our top priority. We would like to give you as much information as possible to enable you to make an informed choice. We would like to detail why installing an AIRCOSAVER makes sense and what can and can not be achieved. In many of the warmer countries around the world air conditioning is one of the largest energy consumers in the residential and industrial sector. On a small scale air conditioning accounts for a large part of home and business owners‘ energy bills. Millions of simple air conditioning units waste unbelievable amounts of energy every day. Not only is the absolute power demand for air conditioning very high, but air conditioning also contributes to extreme peak energy demand on the hottest days of the year which the energy infrastructure has to cope with. No matter how desirable this kind of change is, reality is different! There are millions of older systems in use. In 2001 the Intergovernmental Panel on Climate Change (IPCC) estimated that woldwide a total of over 289 million window/wall mounted units and unducted single split systems were in use. In addition, an increasing number of these types of systems is installed every year. In 2001 only for the mentioned types of systems this number was estimated to be almost 38 million, many of them still being low and mid efficiency units. The most efficient new air conditioning systems are simply too expensive for many applications and payback time is still too long. Besides, many countries still have not adopted high-efficiency standards for new systems. So these simple units will be operating on a large scale for many years to come. They will not just go away. Nor will they be replaced quickly. Average equipment lifetime is typically twelve to fifteen years and in many cases much longer. However, usually these units are not considered for retrofits. Controller manufacturers usually prefer to focus on very large system where even small improvements can be sold for high prices. We think that retrofitting these smaller units makes a lot of sense in terms of overall reduced energy usage and reduced operating costs. 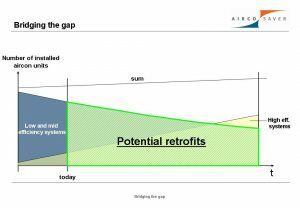 Retrofiting with the AIRCOSAVER can bridge the gap and lower energy consumption considerably until new high efficiency system become more widespread. The AIRCOSAVER has been designed as an affordable and practical device with short payback times. As engineers we do not believe in miracles and we are sure you don’t, either. When we began designing a controller specifically for retrofit purposes, we conducted a lot of research and experimented with various principles (more details here). We also came across all sorts of „unique“ devices and „black boxes“ that claim phantastic energy savings. Over time we became deeply persuaded that the most effective and practical method to create significant savings with the smallest tradeoffs in cooling comfort is to determine the system’s current thermodynamic efficiency and switch the compressor off, when it is evidently inefficient. This is logical since the compressor typically acccounts for 80% of the system’s energy consumption. This, in combination with protecting the compressor against potentially harmful short cycling led to the AIRCOSAVER. We think that out of all retrofit solutions and out of all proposed cycling methods this is the most effective with the smallest costs in cooling comfort. No retrofit will do miracles. With a given system there is always a limit to the possible improvements in energy efficiency. A number of factors are fixed such as the type and efficiency of the refrigerant in the system. Other factors can be optimized such as the runtime of the compressor. A retrofit will not remedy major planning mistakes or technical faults in your system. Installing an AIRCOSAVER can slightly alter the cooling characteristics of your system. With an AIRCOSAVER installed, inefficient overcooling is avoided. This is desired, since a lot of energy is wasted in this stage, but it may result in slightly higher average evaporator coil temperatures since the savings algorithm also provides an anti short cycling protection for your system. In consequence this may have two effects. Firstly, the set point may be reached slightly slower without the wasteful overcooling. However, overshoot of the set temperature is reduced as well. Cooling cycles become more gradual. This is often considered very beneficial in terms of cooling comfort by residents. Secondly, the dehumidifaction capacity of your your system may decrease slightly. In extremely wet climates this can potentially be a drawback. On the other hand, many customers have reported that the AIRCOSAVER has incresased cooling comfort because a certain degree of humidity contributes to the subjective wellbeing in a room. There are various simple air conditioning units that by overcooling make the room air excessively dry. In relation to the benefits, we consider these potential drawbacks as minor for a wide range of applications. Numerous case studies and independent measurement have demonstrated that these changes – although measureable – have very little impact on the overall cooling performance. The AIRCOSAVER can not compensate for deficiencies in the original system. For example, if your aircon system is poorly serviced and does not cool properly in the first place, then the AIRCOSAVER will not change this. Secondly, if an aircon unit is clearly undersized for a given application (too small for the heat load) and the compressor runs for very long periods but the thermostat set temperature is never achieved, then the AIRCOSAVER will not remedy this, either. Only install an AIRCOSAVER on systems that are cooling properly in the first place. Make sure that the aircon unit is in a decent service state (e.g filters should be clean and not blocked). You could also measure the supply air temperature with a small thermometer prior to installation. If this does not fall significantly below 20 degrees Celsius, DO NOT install an AIRCOSAVER. Check if the aircon unit reaches the thermostat in normal operational conditions. If an aircon unit is clearly undersized (i.e. the thermostat temperature is never reached and the compressor simply runs all day) then DO NOT install an AIRCOSAVER. In these instances there are physically no savings possible anyway and the AIRCOSAVER learning phase (until it has understood that the thermostat can never be reached) can result in higher room temperatures. So this situation should be excluded. An AIRCOSAVER will improve the overall energy efficiency of your system. Typical energy savings are up to 30%. Generally these savings come at very small, hardly noticeable decreases in cooling comfort. It uses the the circuitry and switches available in (and designed for) your system and does not require replacement of electronic components. The AIRCOSAVER just adds one control dimension (thermodynamic saturation) to your system and compensates your system’s deficits. Weighing the potential small tradeoffs against the significant energy savings, we think that the AIRCOSAVER is the optimum measure for achieving a significant improvement in energy efficiency. Furthermore, these savings come at an affordable and reasonable cost which will result in a short payback period.